Top caliber food is meant to be paired with excellent service—and the thriving restaurant scene in Asheville should afford career opportunities for people of all socioeconomic statuses. Those are two key premises behind the Table Service Essentials class now offered through partner agencies Green Opportunities (GO) and Asheville-Buncombe Technical Community College. The eight-week course prepares students for service positions in upscale restaurants, transforming their view of waitstaff jobs along the way. “Attitude is one of the first things I talk about, before I even start into serving techniques,” says instructor Tim Tizzano. Beyond that, lessons cover setting tables, approaching and advising guests, writing tickets, pouring wine, mastering nonverbal cues, guiding the meal’s mood and pace, interviewing effectively, and much more. Participation is free for income-qualified applicants, and connecting graduates with local employers is a high priority. 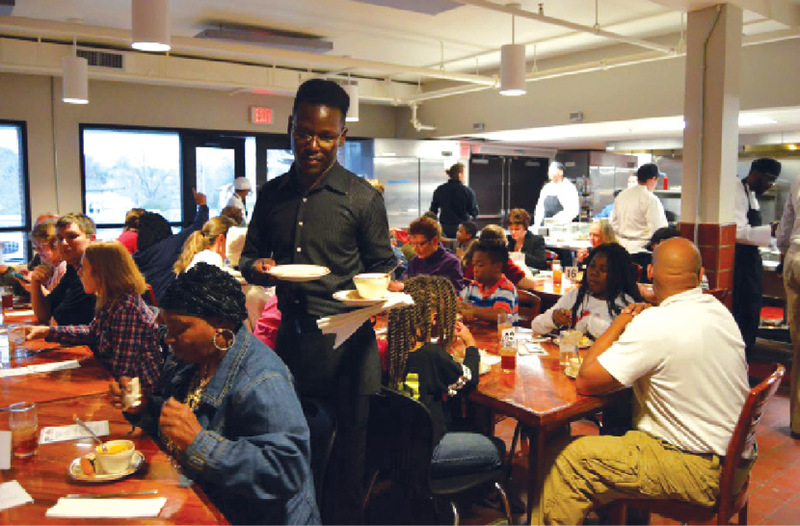 Class members further hone their skills at pop-up dinners held by GO’s Kitchen Ready program. Visit greenopportunities.org for pop-up dinner dates and applications for the table service class.